Hardcover, 9.5 x 11.75 in. / 256 pgs / 51 color. 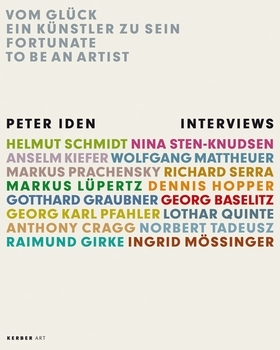 This large-format compilation brings together interviews between the respected Frankfurt art critic Peter Iden and 15 significant contemporary artists from Europe and America: Georg Baselitz, Anthony Cragg, Raimund Girke, Gotthard Graubner, Dennis Hopper, Anselm Kiefer, Nina-Sten Knudsen, Markus Lüpertz, Wolfgang Mattheuer, Ingrid Mössinger, Karl-Georg Pfahler, Markus Prachensky, Lothar Quinte, Helmut Schmidt, Richard Serra and Norbert Tadeusz. 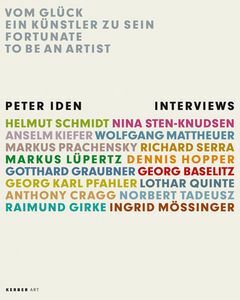 For many years, Peter Iden has enjoyed a reputation as one of Germany's most admired critics, and for each of his interviews he takes evident care to research thoroughly the work of his interlocutor, with the result that he elicits particularly revelatory responses. Each interview is accompanied by color reproductions of works and a brief biographical summary. Text by Gerald Matt. Contributions by Matthew Barney, Anri Sala, Tony Matelli, Tracey Moffatt, Shirin Neshat. FORMAT: Hbk, 9.5 x 11.75 in. / 256 pgs / 51 color.